Want to have fun and contribute to a great cause at the same time? TRIVIA NIGHT is just around the corner! We're helping out with this event so please help us spread the word! 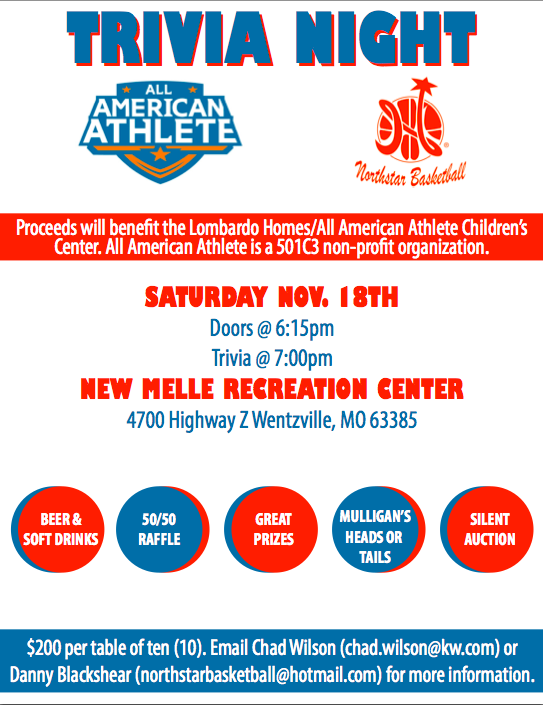 All American Athlete puts the FUN in this fundraiser and the proceeds will benefit the Lombardo Homes/All America Athlete Children's Center. All American Athlete offers a variety of athletic, educational, religious and life coaching services to our youth, but currently they don't have their own facility. As the saying goes, it takes a village to raise a child. At All American Athlete, we believe this to not only be true, but vital to the health and success of any child. All American Athlete offers a variety of athletic, educational, religious and life coaching services to our youth. Currently, we schedule gym time in local gyms in the Wentzville area, but we’re severely limited by the availability of schools and having to work around their own team practices and games. We take whatever we can get, but this sometimes means last minute or late evening practices and games. We are looking to build our own facility that would allow us to have regular, scheduled practice and game times for all of our sports activities, as well as the space to have a learning environment where we can teach our children necessary life skills, sports nutrition, the fundamentals of teamwork and more. Our goal is to raise $1,650,000 for this endeavor. Thus far, we have $400,000 committed in the form of land and site improvements for the facility. Further donations will go toward the cost of the structure and labor to construct. Your donations are vital to the success of our children’s center. Every dollar counts and puts us closer to our dream of having the facilities to continue our mission of contributing to the overall success of each child we work with. There are still some tables available ($200 per table of 10), round sponsorship, and silent auction items.